TLG Expansion: New Greater Los Angeles Area Office! The Tinnelly Law Group is proud to announce the opening of its newest office location in Downtown Los Angeles, California. The opening of the L.A. office is in response to our rapidly expanding Greater Los Angeles Area client portfolio. Our attorneys and staff are already beginning to enjoy the working relationships we are developing with our L.A. clients and their management. Our new downtown location will assist in providing them with the responsive and personalized service for which we are known. 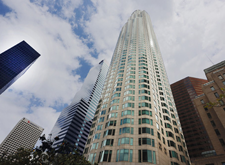 Our US Bank Tower office is located in the heart of Downtown Los Angeles in the premier Class A glass and stone building. At 1017 feet, it is the tallest building west of Chicago and east of Hong Kong, and perhaps symbolized the final rung in L.A.’s climb toward world city status. Over 73 stories tall, it has sweeping 360-degree views of the city.